Loaves and Fishes, a hot meal program, has been providing hot meals since the late 1960s at Noon on Saturdays, Sundays, Monday federal holidays, Christmas, and Thanksgiving -- days when other soup kitchens are closed. Read more about Loaves and Fishes on its webpage. 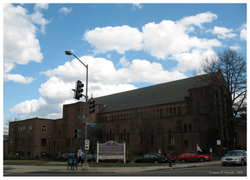 In the 1960s St. Stephen's gave away almost all of its land and helped purchase adjoining properties for the construction of Urban Village, the affordable housing apartment complex that surrounds the church on three sides. Today, the Urban Village Corporation, an outgrowth of that project, works with tenants in Columba Heights who are pursing affordable housing conversions of their buildings. The Urban Village Corporation is made up of St. Stephen's parishioners and Urban Village residents. During the Fall 2009 Help the Homeless Mini-Walk, parishioners detailed some of these efforts; you can see some of this in a video posted on YouTube. St. Stephen's is a member of the Washington Interfaith Network (WIN); parishioners are active in many of WIN's efforts to improve city services in our neighborhood and across the city. Read more about WIN on its webpage. The Samaritan Ministry of Greater Washington was founded at St. Stephen's Church in the 1980s and has since gone on to become a city-wide social service agency. St. Stephen's remains an active member of the Samaritan Ministry of Greater Washington. St. Stephen's Housing. With another organization, St. Stephen's Church owns two homes on Newton Street that are used as transitional housing for families moving out of homelessness. St. Stephen's Church offers sleeping space on its floors to groups traveling to Washington, DC, for protests, conferences, service work, or other events. St. Stephen’s has offered space since the 1960s; tens of thousands of people have slept on their floors over the years, protesting various wars, demanding equal rights, witnessing for peace at military arms bazaars and at the Pentagon, protesting international structures that support inequalities, doing service work on alternative spring break trips, or attending conferences or learning about life in the inner city. African Immigrants & Refugees Foundation enables new African and other immigrants and refugees to achieve a smooth transition to the American culture through multicultural counseling, consultation, education, training and support services. Brainfood uses food as a tool to build life skills with youth in a fun and creative setting. Brainfood uses St. Stephen's kitchen for its after-school and summer programs and maintains an office at St. Stephen's. Committee in Solidarity with the People of El Salvador (CISPES) was formed in 1980 by US activists in order to support the revolution in El Salvador. CISPES channels direct financial support to projects that advance the strategic needs of the revolution and has sent more than 2,000 people on delegations to El Salvador. CISPES has organized many US protests that have been crucial in confronting the U.S.-directed strategy of "low-intensity conflict." The Homeless Children's Playtime Project nurtures healthy child development and reduces the effects of trauma among children living in emergency family shelters in the District of Columbia. It believes that play is a human right that all children deserve, regardless of housing status and seeks to help create a city that provides every opportunity for homeless children to succeed by advocating for affordable housing and safe shelters for all families. Positive Force DC recruits volunteers, raises funds, and gathers donations of food for neighborhood charities through benefit concerts, mostly aimed at youth audiences. Founded in 2000, One Common Unity nurtures sustainable, caring communities by strengthening individuals and families through innovative peace education, arts, and media. One World Education works with students and educators to improve learning and literacy in schools and communities. The mission of One World Education is to promote global awareness, literacy, and meaningful citizenship with educational resources that give voice to youth perspectives on culture and global issues. SpeakeasyDC, Washington’s premier storytelling organization, promotes the art of autobiographical oral narrative through events, classes, consulting, and recordings. Events include a monthly open mic series, ensemble performances, story socials, and special events. STITCH is a network of U.S. women organizers, trainers and activists which supports and connects Central American and US women organizing for economic justice. Thrive DC works to prevent and end homelessness by providing vulnerable individuals with a comprehensive range of services to help stabilize their lives. Thrive DC--originally founded in 1979 as the Dinner Program for Homeless Women--provides the last available safety net for people facing economic crisis and housing instability while also providing the first step towards independence for people experiencing extended periods of homelessness. The Washington Peace Center was founded by Quaker activists in 1963. In the 1970’s, the Peace Center was a key organizing force in the anti-nuclear movement and became an instrumental player in opposing US intervention in Central American countries. The Peace Center evolved to focus on local and domestic social justice issues as well, such as local anti-racist work, abortion rights and Native American rights. Throughout the 1990’s, the Peace Center worked on fair trade and international economic justice issues and were directly involved in mobilizing protests against the first Iraq War. The Peace Center moved to St. Stephen’s in 2009. We Are Family provides free advocacy, services (such as transportation, groceries, visits), and companionship to isolated, low-income seniors in the Columbia Heights, Park View, North Capitol, and Shaw neighborhoods. Words, Beats & Life is a hip-hop nonprofit that sponsors after-school programs, conferences, and an academic journal, providing a series of youth-focused programs and activities to bridge the gaps between the critical, academic community, the artists, and the youth who consume what the artists create.